Growing Up Geeky: Pool time with our Snapping Turtle Kids swimsuit! 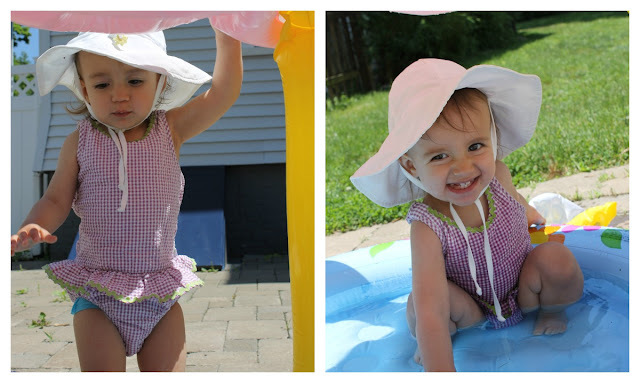 Pool time with our Snapping Turtle Kids swimsuit! So far we have not had the best of luck in finding swimsuits for Carina. You might remember last summer she was busting out of her Size 6-12 Month swimsuit at only 5 Months old. Our next try, we lucked out with a Size 18 Month rash guard but it was a little big and just not the cutest. I much prefer adorable bathing suits over rash guards. What can I say? I just love the frills and patterns. I was so excited for Carina to try a Snapping Turtle Kids swimsuit. Looking at their collections, they seemed to me to be the perfect blend of cuteness and practicality. 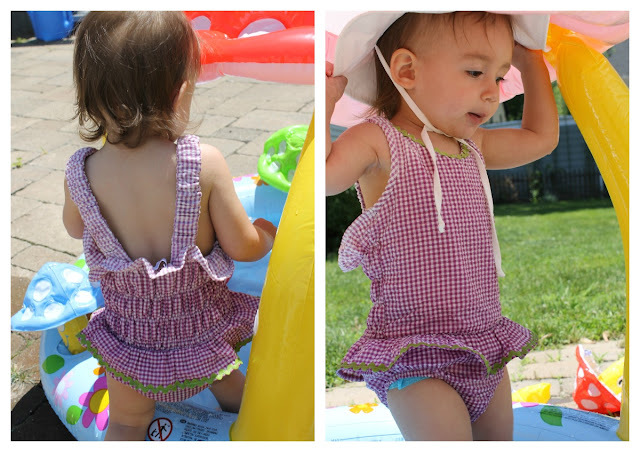 Carina is wearing the Nantucket Ruffle Swimsuit which is 100 % Cotton and has snaps made of stainless steel at the very bottom. This makes for quick and easy diaper changes! There is no need to take off the entire suit when baby drops a deuce. Just unsnap, take care of the mess, and then snap back up. There are two different snap settings, so it's also a breeze to give baby a little bit more extra room when she grows. I am in love with the purple color and gingham pattern of this swimsuit. The green border around the ruffle and neck makes for a super cute accent, as well. My favorite part? The ruffles on the back, hands down. Watching her toddle around in this suit with her ruffly bum makes me smile endlessly. Each strap of the suit has two button holes as well, so you can easily adjust for more room at this end as your little one grows. Carina's suit is size 18 Months, and it will definitely take her through the end of the summer - there is some extra space and she is on the smaller strap and snap setting. She is 17 Months and 19.5 lbs. Snapping Turtle Kids recommends ordering true to age. Most infant and toddler swimsuits tend to run insanely small (like the one we stuffed Carina into last summer), that's not the case here. I actually had a hard time choosing a suit! My other favorites were the Southampton Ruffle and its matching Cover Up, and the Capri Ruffle. Again, Momma has a weakness for ruffles ;) In addition to swimsuits, Snapping Turtle Kids carries a number of other products including totes, swimsuit bags, hats, and cover ups. My friends at Snapping Turtle Kids gave me a promotion code just for my awesome readers! Enter code STKGeeky to receive $10 off of a minimum $30 purchase. I was not compensated for this review. I received the item free of charge for reviewing purposes. All opinions are honest, and my own. Your experience may vary.